Reissue of this ultra rare EP!!! In recognition of that holiest of holy days, Record Store Day, the masked mutants in GHOUL have released (and sold out on that same day) Hang Ten, a limited edition six-song (mostly) instrumental 10" EP, in 2014. 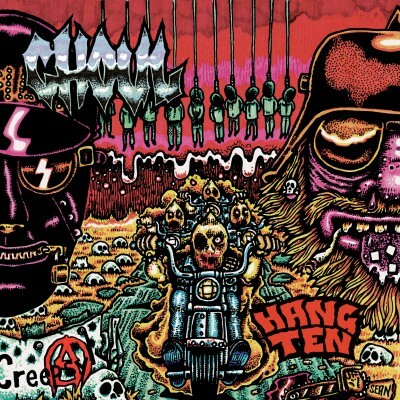 Featuring guest vocals from Tony Foresta (Municipal Waste, Iron Reagan) as Henchman #1 and the inimitable R.A. MacLean (ex-Deadbolt) as Kreeg alongside Digestor, Cremator, Fermentor, Dissector and The Moron Cavern-Shackled Choir, Hang Ten was recorded by Salvador Raya at Earhammer Studios in Oakland (birthing home of Splatterhash, Splatterthrash and Transmission Zero), mastered by Dan Randall at Mammoth Sound Mastering and sports cover art by Sean Aaberg of Pork Magazine. Surely an anomaly in GHOUL‘s catalog, the EP features songs written exclusively in their unique brand of surf metal the quartet has previously only dabbled in. Hang Ten picks up right where Transmission Zero left off, relaying the tale of a Creepsylvania in tatters, and the terrible power struggle that ensues between two vicious motorcycle gangs.